We often associate home water damage with large-scale causes like flooding or other natural disasters, but sometimes water can slowly cause damage to your home in some less expected places. Be sure to perform routine checks on these systems and appliances to avoid serious water damage to your home and belongings. Burst pipes are more often an issue for colder climates that may experience below freezing temperatures, than in Southern California. As water expands under freezing temperatures, pipes experience intense pressure, causing them to burst or leak. While we don’t typically see these temperatures, older homes with rusty or weak pipes can also experience water damage from burst pipes. Clogged or blocked plumbing may also cause an increase in water pressure which could result in a burst pipe. Be sure to keep plumbing lines clean, and remain calm if a pipe does burst in your home. If there has been a pipe burst, locate the main valves in your home (at your water meter), and shut them off as soon as possible to avoid additional water damage. Faulty plumbing may cause gradual damage to your home, which may not seem urgent when you notice it, but could end up being a huge headache. Make it a habit to check faucets and visible pipes on a routine basis, and address any issues when you see them. You’re pretty handy yourself, eh? Fix your own leaky faucet by first identifying what type of faucet you have, then follow steps for your particular faucet. 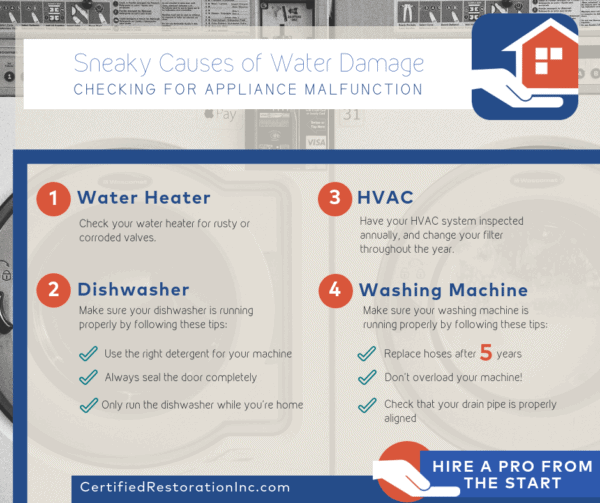 Most people use their home appliances on a daily basis, but sometimes it can be hard to see when water damage is occurring until it’s too late. Rusty or corroded valves at the top of your water heater could be the source of water leakage in your home, here’s what to look for. Worn out hoses, uneven installment, and broken doors can make your favorite appliance a total nightmare if not managed. Your heating, ventilation and air conditioning system could cause severe water damage if not maintained. With warmer temperatures arriving quickly, and your AC running more frequently, make sure your HVAC system is ready. Similar to your dishwasher, washing machine hoses deteriorate over time. If your machine’s hoses are over 5 years old, it’s time to replace them! Drainage failure can also cause severe flood damage- make sure your drain pipe is properly aligned and DO NOT run your machine if there has been a sewage backup. Bonus tip: we know you want to get your laundry done ASAP but, do not overload your machine! Crawl spaces are probably the “sneakiest” place that water damage can creep up into your home, and even affect the structural integrity of your home’s foundation. Although they are not common in San Diego, crawl spaces and basements can be found in the historic neighborhoods of Hillcrest, North Park, and Golden Hill. Water damage in your crawl space can also result in buildup of mold or mildew, wood rot, and cosmetic damage, like peeling paint. It’s important to check up on your crawl space to avoid issues later, as dark and scary as it may be. Take precautions a step further by following these tips to prevent crawl space moisture. With regular maintenance and basic knowledge of your home’s water systems, water damage prevention can be simple. At Certified Restoration, we know taking precautions isn’t always enough. We’re here for you before and after water damage occurs.